With President’s Day just around the corner and the Pats winning the Superbowl, I decided it was time to pull out my cute patriotic sweater from Mod Cloth! Oh and of course, it has hearts for Valentine’s Day too! And you all know I enjoy throwing some plaid into the mix these days! 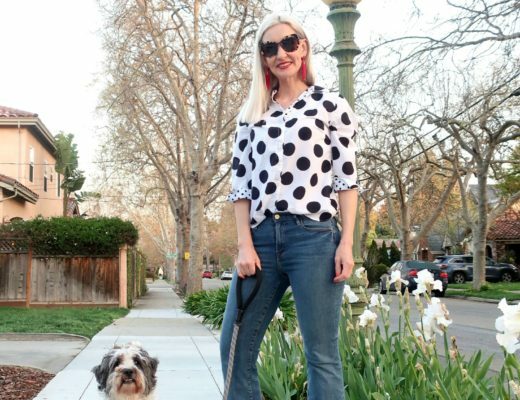 A huge thanks to all the fab bloggers who linked up for FUN FASHION FRIDAY last week! 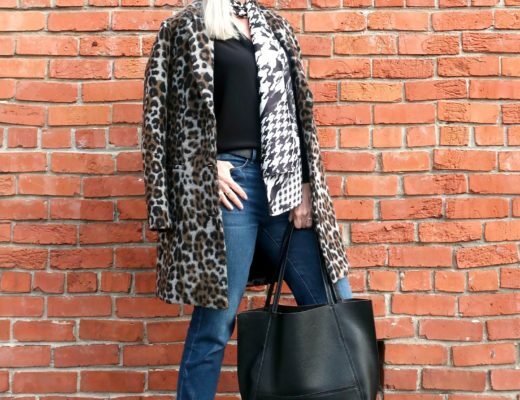 Cherie of Style Nudge in this fabulous plaid duster! Also love the cuffed jeans and wicked hot shoes! 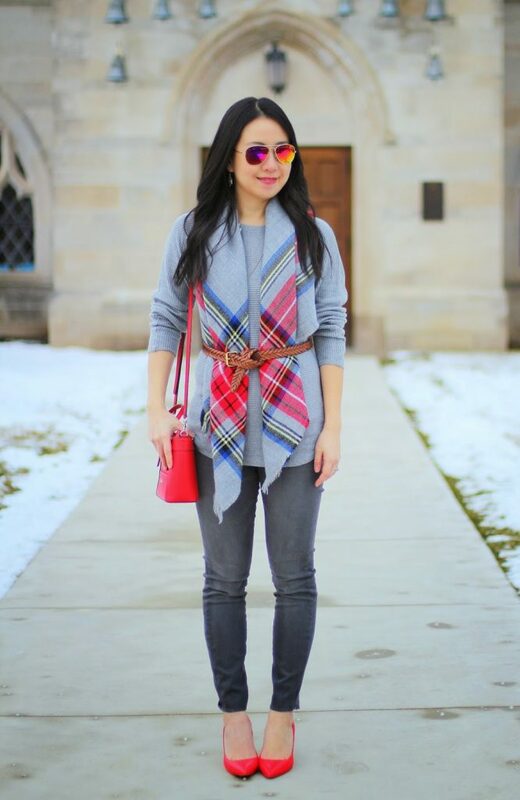 Cynthia of My Rose Colored Shades looks lovely and chic in her gray ensemble with pops of red! 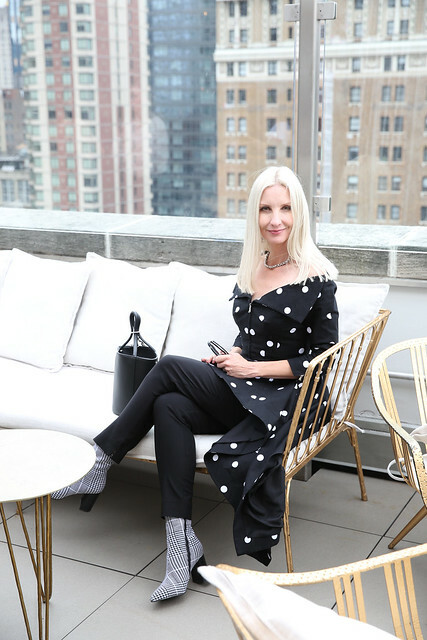 Amy Ann of The Real Arnolds is the epitome of cool in these black coated jeans with a leopard clutch. And beautiful Jill from Doused in Pink is looking chic in her fabulous colorful cardigan and riding boots. Okay ladies, can’t wait to see what you’re sharing with us this week! And if you haven’t already, you can like and follow Facebook page here! 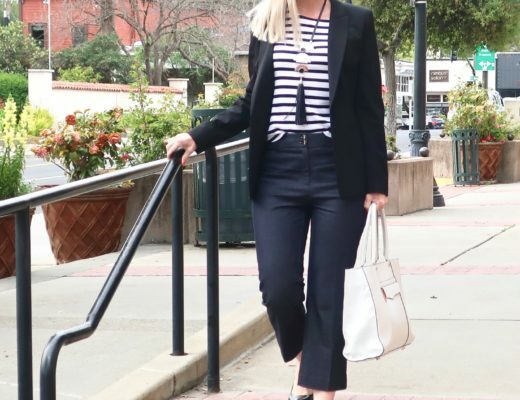 Joining these links up as well: Passion for Fashion! Fashion Item Friday! Fab Favorites! Look What I Got! Lessons with Coffee! Visible Monday! Mix It Monday! How I Fall! Shoe and Tell! Still Being Molly! That sweater is so cute!! So perfect with the plaid. That sweater is so cute! Love the stripes and hearts with the plaid peeking out! Thank you so much for featuring me and hosting the linkup! Hey Dawn, thanks so much for referring me to your link up before or during my break in January. 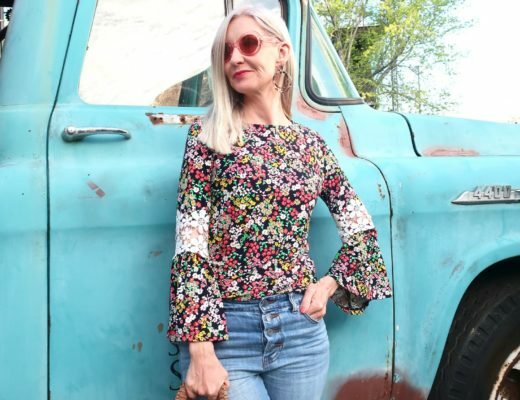 I love the ladies you featured and their styles, what an awesome link up so far. I wish you the best. "Bloggers Who Have Inspired Me" link up will be back on Tuesday. Looking forward to your links again. By The way, I love your top! It is almost festive enough for American holidays too (July 4th, Veterans day). That's a really cute sweater and how your styled around it is genius! You got some awesome ladies around here!! Hearts, stripes and plaids . . . three of my most favorite things and all mixed together, well you just put a huge smile on my face. I love your red, white, and blue! Absolutely love the sweater & purse! That is such a great way to mix patterns, and a very cool casual look. Love the stripe/plaid mix, very cute! 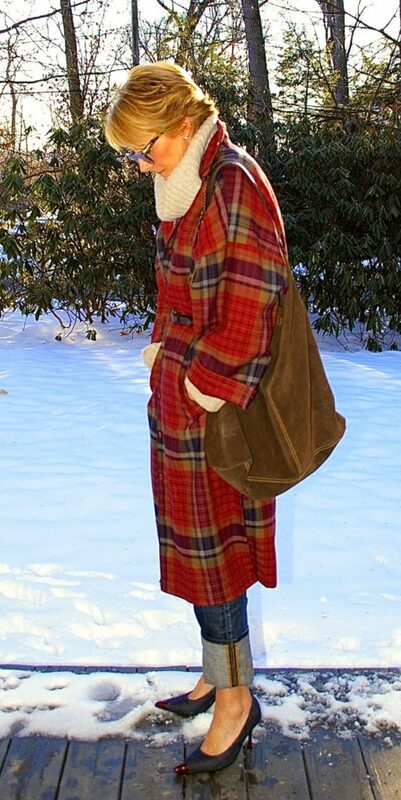 Thank you so much Dawn for featuring my Red Plaid Duster Post! Love your Red, White and Blue theme – you've inspired me! Woo! Hoo! I actually remembered something this week! The January brain must be improving. Thank you for hosting! Your sweater is so cute and fun! I love it! I just clicked on your link, I had no idea you had your own linkie! Love your sweater, looks handmade! Love the cute sweater, and the sneakers! I think we all need to dress causually but still be put together and you did it well, my friend! Lovely. Hope you have a great weekend! Congrats! You look like a high school senior in that outfit. Thanks for the link up and have a nice weekend! I am loving this patriotic sweater! Such a great print! Go Pats! Darn, missed the link up.. kids have been sick this week! 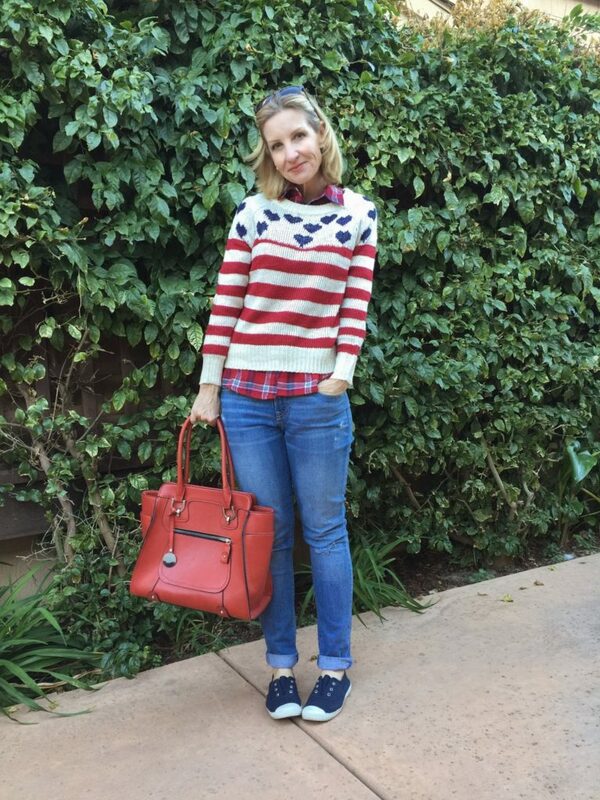 😛 I really love that patriotic sweater from ModCloth… I have heard of them, but never purchased anything from them. Love this outfit! Great looks… I love the Valentine's Day sweater! Adorable all-American look! Love every element. Very cute! Are those blue lips or birds, or hearts? Regardless, you're adorable and I'm taken with the layers and pattern mixing: bold and very smart and approachable. I chose a black chiffon Bisou-Bisou surplice shirt with big red kissy-lips all over it to wear at the restaurant on V-Day. Dan looked at it and said "Yikes! Disembodied lips! Scary … do you really want to wear that?" Yes. Yes I do. Ha!